Primary motivation for Arteria is to have a high performance messaging system between two separate threads in an application, especially between the UI thread and Web Workers in a browser application. The focus on intra process communication sets Arteria apart from other messaging libraries that gear towards network communication. Having said that, it is entirely possible to use Arteria also for network communication using, for example, WebSockets or plain old TCP. To use Arteria in your application add following dependency declaration to your Scala project. "io.suzaku" %% "arteria-core" % "0.1.0-SNAPSHOT"
"io.suzaku" %%% "arteria-core" % "0.1.0-SNAPSHOT"
The architecture of Arteria is built on a hierarchy of message channels. 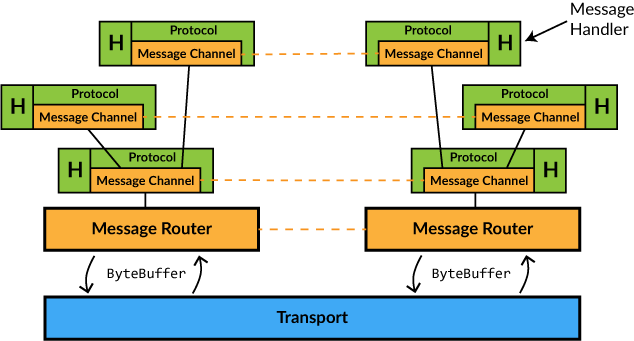 At the root there is a special channel, the MessageRouter, that performs the actual communication with another instance of MessageRouter for all the channels. On top of the router you can have one or more layers of application message channels sending messages back and forth. Arteria core doesn&apos;t provide the actual transport between the routers, just a binary stream of data, allowing users to choose appropriate transport implementation according to their needs. This also implicates that the flow of messages is inherently tied to the transport triggering a flush on the router to get the backlog of messages to send. The serialization of messages travelling on the channels is performed by BooPickle, which provides highly optimized pickling utilizing an efficient binary stream format. The stream is converted into/from a ByteBuffer for transportation. Each MessageChannel is associated with a protocol providing type safety and symmetrical serialization for the messages on that channel. The protocol also defines the types needed for materializing and initializing the channel on the other side. Finally every channel has a user defined handler that is called for each received message and for other things that require action from the application.